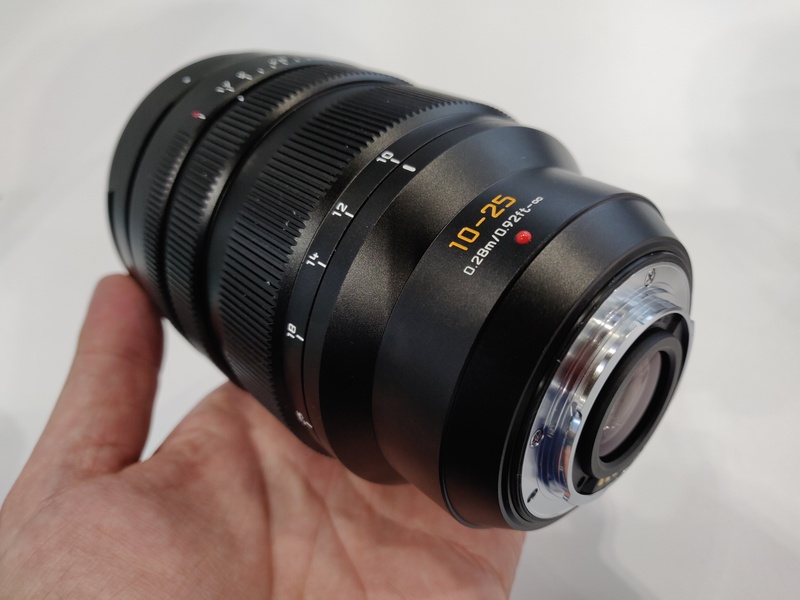 Panasonic are showing a working version of the new Leica 10-25mm f/1.7 Micro Four Thirds lens, at The Photography Show 2019, at the Birmingham NEC. We had a hands-on look at the new lens, which was first shown, in prototype form, at Photokina 2018. The lens gives the equivalent of 20mm to 50mm, and is lighter than it looks, considering the (large) size of the lens. The lens extends slightly when you zoom to 25mm, and the closest focusing distance is 28cm. The lens on display is a working pre-production sample, so we were unable to take sample photo using the lens, however we can tell you that the lens works very well on a Panasonic Lumix G9, and focus was rapid. The aperture ring on the lens we used is clickless, which means it's silent and can be smoothly adjusted, perhaps indicating that the lens is specifically suited (or rather designed) with video work in mind. The lens zooms smoothly through the zoom range, and has a 77mm filter thread. This is great, i have so many questions. Is this lens bigger (taller) or smaller than Panasonic Leica 50-200mm? Is it heavier or lighter than Panasonic Leica 50-200mm, and how much? Is it parfocal (this is important for video)? Do they have any itention for putting image stabilization? And finally is there any words when are they going to put this lens in market? Thank you for pictures, I have plan to buy this lens. This is great, i have so many questions. Is this lens bigger (taller) or smaller than Panasonic Leica 50-200mm? Is it heavier or lighter than Panasonic Leica 50-200mm, and how much? Is it parfocal (this is important for video)? Do they have any itention for putting image stabilization? And finally is there any words when are they going to put this lens in market? Thank you for pictures, I have plan to buy this lens. Scared to think of the cost though... Probably around £1500? Thanks for sharing these pix. Does the lens have the much-requested manual clutch focus capability, obtained by retracting the focusing ring towards the mount? Hi Josh, That is excellent news. Any pix of it? Quote:Hi Josh, That is excellent news. Any pix of it?